When you’re shopping for new luggage, it is important that you know exactly what you want. Do you want softshell or hardshell? Carry on vs. checked baggage? One or two packing compartments? If you don’t have answers to these questions, don’t stress too much; I’m here to help you. 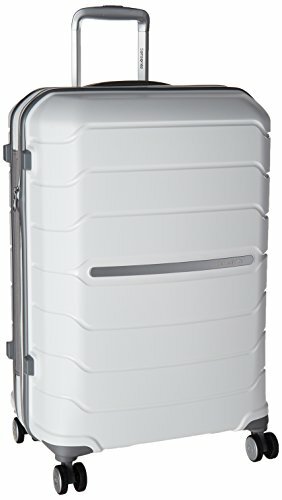 My ideal piece of luggage is lightweight but incredibly sturdy – with a hardshell, obviously. It has spinner wheels and a TSA lock, and without a doubt, it has to have a zippered divider. If you agree with me about these demands, then you’ll love Samsonite Freeform. It has all of the above, plus some other cool features. 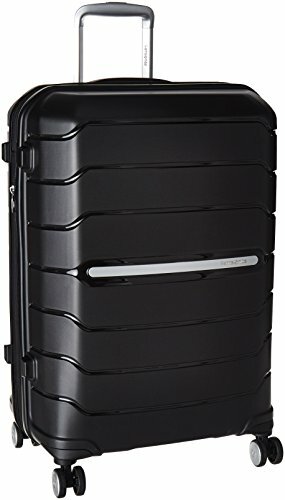 If you want to find out what they are, check out the rest of this detailed review of the Samsonite Freeform! Should You Go For The Samsonite Freeform? 19.5" x 14.5" x 10.0"
The Freeform is made of injection molded polypropylene, a material that is incredibly lightweight. You can also see that from the weight of these suitcases – the 28” weighs less than 10lbs! That is important because it means that you can pack more items inside the suitcase, while still remaining under the 50lb limit for checked baggage. This material is also moisture resistant, so you don’t have to worry about your luggage contents getting wet in the rain. A not-so-good thing about polypropylene is that it scratches way too easily. Therefore, don’t be surprised if your Freeform comes out scuffed after its first trip – that is the price you have to pay for such a lightweight suitcase. However, this is also a really durable material, so you probably won’t have to deal with any other type of damage. For the closure, the Freeform is equipped with a zipper. Did you know that thieves could break into your zippered suitcase by putting a ballpoint pen between the zips? That is the sole reason why I prefer luggage with latch closure. But, don’t let my personal taste impact your decision – the TSA lock should be plenty good at keeping your luggage contents secure. Let’s talk a little about the aesthetics of the suitcase. 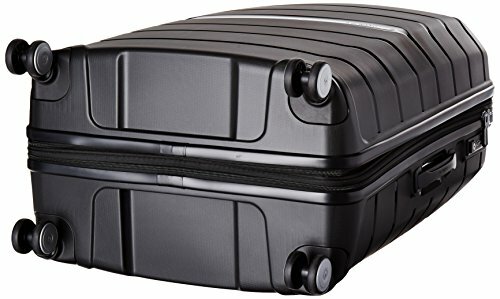 The shell has a ribbed design, with the Samsonite logo strategically placed in the middle. What I particularly like about the Freeform is that the accents on the inside (the zipper, the straps) match the color of the shell of the suitcase. I also like that you can get it in 3 different colors (on Amazon), and the Sage Green is definitely my choice! The telescopic wheel handle is equipped with a button that locks the position of the handle when pressed. It can be locked to different heights, so everyone can adjust it to the height that suits them best. 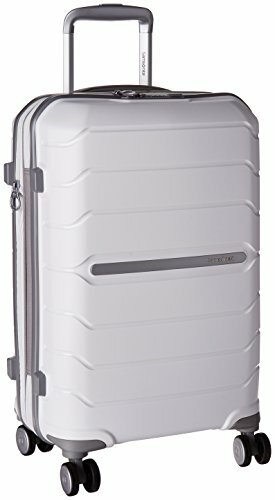 Additionally, it can also be locked when it is fully lowered, so you don’t have to worry about the handle sliding out when the suitcase is lying flat. There are 2 carry handles on the Freeform. One is on the top of the suitcase, and the other one is on its side. 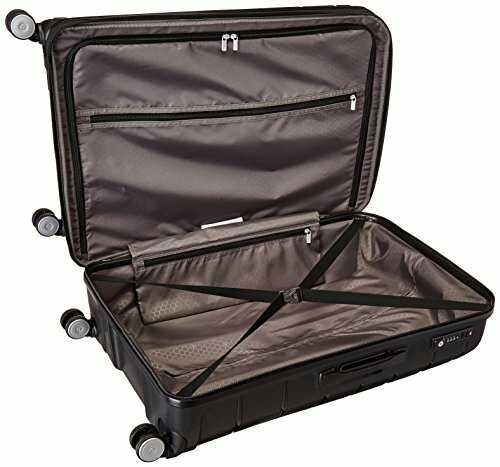 They are very sturdy and you don’t have to worry about the handles breaking off from the suitcase when you fully pack it. The handles are also subtly engraved with the Samsonite logo, which I find to be a cool addition. Samsonite’s Freeform is equipped with double spinner wheels – as it should be. 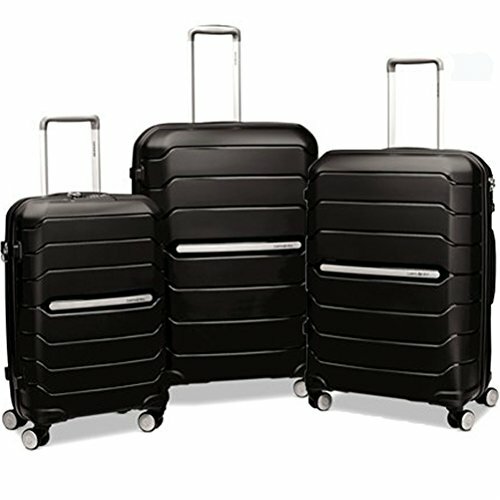 It’s the 21st century – I don’t even glance at luggage that doesn’t have spinner wheels anymore! They will provide you with superb maneuverability and steering of the suitcase no matter how much weight you manage to pack inside it. “Spinner” wheels means that each wheel is able to turn 360 degrees. This means that you don’t have to tilt your suitcase to get the wheels turning. In fact, you can even push it in front of you, or roll it alongside you – you can do whatever you feel like. And, you know what else? Since you don’t have to tilt and drag the luggage, there is much less strain on your arms and shoulders. With the Freeform, you’ll never again be sore just from dragging your suitcase behind you. Great news for all of you who fly to US frequently! The Freeform has a recessed TSA combination lock. The original combination you need to first open up the suitcase is 000, and then you can change it whatever you want. Once you set up your combination, no one except you will be able to unlock the suitcase – and the TSA agents of course. If you aren’t familiar with TSA agents and locks, I’m here to help. TSA agents operate at US airports, and their job is to make sure that all luggage is inspected and that no one has anything illegal in their suitcase. They usually choose a few suitcases for inspection randomly. If you are “lucky” enough to be chosen, a TSA lock on your suitcase means that they can open it up, inspect it and then lock it again. Otherwise, they will have to open up your luggage forcefully. Other types of locks are not TSA friendly, and the agents cannot unlock the suitcase without damaging it. So, if you want to be on the safe side, always opt for luggage with TSA friendly locks. Luckily enough, the Freeform falls into that category. When you open up the Freeform, you get 2 packing compartments, both lined with fabric. In the bottom compartment you will find elastic cross straps for keeping your clothing in place, as well as a single zippered pocket. The pocket is a great inclusion because it really helps you stay organized when travelling. As for the top compartment, it can be fully closed off with a zippered divider. 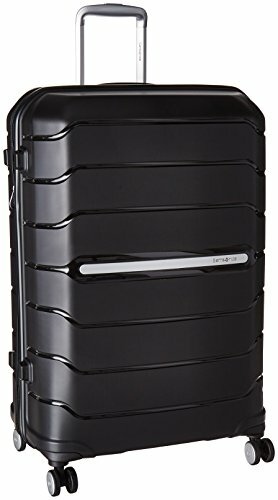 This does a better job at keeping your luggage contents in one place, and you don’t have to worry about anything falling out. Additionally, there is a large zippered pocket on the divider, which you can use for any items you want to keep separate. A great benefit of this suitcase is that it is expandable. The zipper for expansions is right next to the one for closure, and when you want to expand your suitcase all you have to do is unzip it. I love expandable suitcases because I always over pack, and then I buy a ton of things on my trip, so fitting everything in my luggage gets challenging. If you are anything like this, the Freeform’s expansion feature will do wonders for you. Overall, the Freeform is a great piece of luggage. It is made of a sturdy material, which has the benefit of being extremely lightweight. The only problem you might experience with the shell of the suitcase is that it will get scuffed easily. However, you can easily solve that issue by getting a clear cover for it. 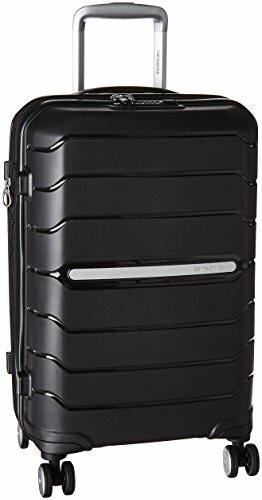 This Samsonite suitcase has all the latest quality-luggage necessities – a TSA lock, spinner wheels and the telescopic wheel handle. 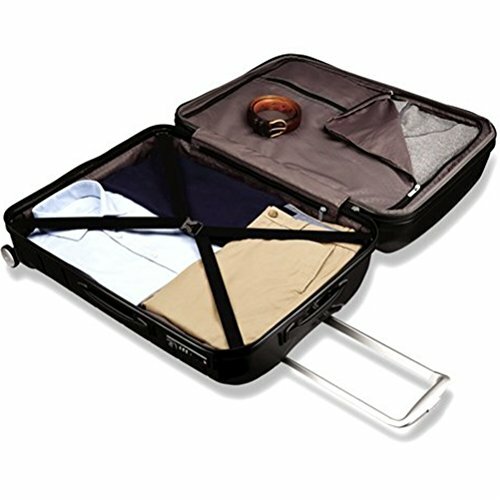 Additionally, you’ll love packing your clothes in this suitcase because you will be able to organize every little detail. And, the zippered divider will make sure that everything stays in the exact place you want it to be! If you love the Freeform so much that one suitcase is just not going to be enough, I would advise you to check out these sets. If you need more than one suitcase, you can save a lot of money by getting them all together. Weight 21 (6.5lbs. ), 24 (8.48) and 28 (9.59lbs.). Cross ribbon straps help keep content in place. Split book opening that provides two fully lined packing compartments. Multi interior pockets that help you manage your belonging while traveling. If you want to get just one, then head over to Amazon. They’re on sale and you can get a great deal!